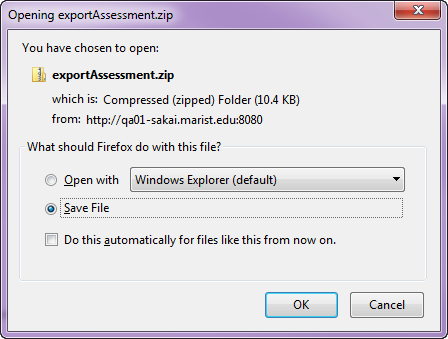 Sakai Guides and DocumentationAssessments and Grading AssessmentsHow do I import and export assessments? Three export formats are available, IMS QTI 1.2, IMS Content Packaging, and Markup text. Content Packaging will capture links and attachments in your questions and package the file as a .zip file; you must transfer links and attachments yourself if you use IMS QTI. Both formats create an XML file of your questions with all the components labeled according to the IMS standards. Zoom: To import an assessment, click Import. Zoom: Select your file, and click Import. 1. Click Choose File to browse for the file on your own computer system and open it. Once you have selected your import file, it will show the file name next to the button. Click Export for the assessment you want to export. Zoom: Click Export for the assessment you want to export. Zoom: Choose the export type and export. Prev: How do I set up a random question set? Next: How do I import a question pool?